Lt.(jg) Rowland and Lt.(jg) Jones received the Distinguished Flying Cross. Air Medals were awarded to Lt.(jg) Anselmo and Wood, E.W. Jr., and a gold star in place of a second air medal to Denauw, Smith and Garren, and Watson. On 23 July 1943, 94-P-5 departed Belem at 0610 on an anti-submarine sweep. The flight had been at a constant altitude of 2000 feet throughout the morning, passing through the the bottom of the clouds. At 1050 the plane was passing through a moderate rain squall. At 1102 it was in the clear, there being a high overcast at 18,000 feet. Visibility was 10 to 15 miles due to haze, except to starboard, where, at five miles there was a heavy rain squall. At 1106 the bow lookout reported a submarine on the starboard beam. The position was 07-10 North, 51-36 West. The pilot started to turn in that direction and immediately saw a submarine still surfacing. Preparations were made to attack and the plane was nosed over. While still three and one half to four miles away, the submarine commenced firing. Lt. Paul Weber, USN, the pilot, started a slight evasive maneuver while in the dive. At one mile from the sub the bow gunner fired 30 rounds, then the gun jammed due to a defective shell. The sub on surfacing was on course approximately 060 degrees true at about 4 knots and increasing speed. It was making a turn to starboard in an effort to reach the rain squall which was a quarter of a mile away. The pickle was pressed at about 200 feet from the sub at an altitude of 100 feet and with an indicated air speed of 195 knots. Lt.(jg) J.T.Cline noticed two or three men leaving the deck gun and running to the conning tower. 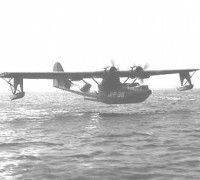 The starboard gunner started firing as the plane passed over the submarine. His gun jammed however after five rounds. He saw the port bombs enter the water approximately 20 feet on the port side of the U-boat just forward of the conning tower. The two starboard bombs fell in front of the sub approximately 20 to 25 feet which fact was verified by the man in the tower. Both men saw the submarine's bow raise out of the water approximately 20 to 30 degrees from the explosions and roll over the starboard side and sink. From full surfaced position at the time of the explosions the sub disappeared in 7 to 8 seconds. The port blister gun fired about eight rounds. Lt.(jg) J.D. Engels, Sorrell, J.C. and Simons, J.D. saw a large black oil slick 15 to 20 yards wide. The plane passed into a rain squall within 15 seconds of the attack. After getting the plane under control the pilot turned to starboard and came out of the rain squall about 3 to 4 miles south of the attack, then started back to the area which was being rapidly covered by rain. Just before the rain closed over the area, a large black patch of oil could be seen, but by the time the plane returned, it was closed over with heavy rain. Smoke bombs were dropped and the plane departed to the clear. Another smoke bomb was dropped out side the rain area and when the rain came down to it, another was dropped. The plane was pushed westward gradually by the wind and the rain. MO's were sent for other planes. Peter 5 was relieved at 1215 Peter by 94-P-15. The assessment of this attack was "probably slightly damaged." The Commander Fourth Fleet in forwarding the report of anti-submarine action by aircraft No. 6 to the Commander in Chief United States Fleet said, "This command notes with pleasure the unremitting activity of VP-94 during July 1943. Squadron planes flew 1126 hours leading to six attacks and three probable sinkings of enemy submarines during the month." What proved to be the last enemy submarine attacked by VP-94 was one located off Fortaleza, Brazil. 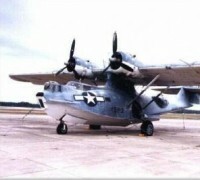 94-P-6 departed from base 3 November 1943 at 1300 Peter to provide coverage for convoy TJ-12. While coming up the track of the convoy, the plane was at 3000 feet making use of cloud cover. At approximately 1345 Peter at 03-33 South, 37-42 West, the bow watch sighted a submarine's wake 45 degrees off the starboard bow at a distance of ten miles. The wake was described by the pilot as fairly broad and about 100 yards long. The lookout could see waves breaking as far back as the submarine's conning tower, indicating the sub was running with decks awash. The plane was turned to starboard and kept in the clouds. The sun was kept behind the aircraft as a gradual let-down was made. The approach was from the submarine's port at an angle of 35 degrees relative to his course. After dropping from 150 feet, a sharp evasive turn to the port was made, Just as the drop was made, or very shortly before, the sub started to submerge, turning hard to port. Just before they passed over the enemy craft, the pilot and the co-pilot saw three separate, distinct puffs of white smoke issuing from the conning tower. The submarine was completely submerged 30 to 45 seconds after the drop. The number two and number three depth bombs failed to detonate and resulted in marring a perfect attack. The number two charge was dropped abeam the conning tower on the submarine's port. The number three depth charge entered the water just at the bow on the starboard side. By this time, the number of U-boats in the South Atlantic area had become smaller and smaller. 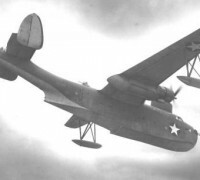 VP-94 Planes continued to fly tens of thousands of miles on anti-submarine sweeps based on D/Fs, estimates and reported sightings by other planes and surface craft. The November attack proved to be the final one for the squadron in the Solant region. With a detachment of ?? aircraft already operating from Belem, squadron administration was moved to that base from Natal in mid July 1943. Detachments were maintained at Fortaleza for a time, at Zandery Field, Dutch Guiana and at Fernando Noronha. Fortaleza was much appreciated for the good living conditions obtainable and the recreation facilities...among which were listed horseback riding and swimming and sunning on an attractive. beach. Zandery was a different story...situated at the edge of the jungle...and hampered by an equatorial, steamy climate. Practically all flying was night flying, performed in poor weather. Prices were high, recreation was almost unknown but the detachment was regarded as good duty because of the 33% increase in pay for duty on Dutch territory. Even the extra pay seemed small recompense for do conditions faced. Fernando Noronha, a small island 150 miles northeast of Brazil's bulge, became a base for anti-submarine operations in mid 1943. It became known as "The Rock" probably because part of it was reserved as a penal colony for Brazilian convicts. The Rock proved to be a mass of red and sticky mud with incidence of rainfall that could only be described as colossal. The plane captains refused to allow any one to enter one of the 94 Cats without first removing his shoes. But Fernando had a lot on the credit side as well, including such activities as fishing for tuna and barracuda...volley ball, basketball, and baseball, mountain climbing, hiking, and excellent surf swimming. It also served as a training ground for the squadrons newest navigators. Anti-submarine sweeps were often plotted out into the sea to PLE. Fernando HAD to be there when you came in... with somewhere around a hundred gallons of gas left in the tanks. Throughout its career in South America, the personnel and planes of VP-94 have been on duty in almost every coastal community. When the list includes the bases at which 94 officers have served under detached duty orders, a complete Baedeker of Brazil is compiled as witness a squadron letterhead suggested by Lt. Comdr Swenson, but never used because of its necessarily high classification. We move anything...Bombs, bullets, fresh meat (good and bad), USO shows (good and bad), admirals' bands, Brazilian laborers. carrier pilots (who need flight time), dogs monkeys, beer, booze, gems, appendicitis cases, malarial patients, people with fractured skulls, PV survivors, jewel merchants, disbursing officers (good and bad), Admirals, Captains, Commanders, Lieutenants, Ensigns, and other high ranking officials.